Breaking down this issue of Colliers Magazine to its nuts and bolts it has 46 pages, a count which includes the front cover and inside-front cover, plus the 2 pages made up of the inside-back cover and back cover, for 48 pages total. Including the covers there are 12-1/2 pages of total advertising which comes to about 26% of the issue. The largest category in this issue is fiction, which comprises 21 total pages or a whopping 44% of this magazine. Articles and non-fiction, which I’ve counted as everything that is not fiction or advertising, take up another 13-1/2 pages or 28%. That gets us to 98% with the little bit left over being the Jack Frost cover illustrated by E.M. Jackson. Well, sitting down with this issue, I’ve got to tell you, I wasn’t about to read 21 pages of fiction. If it were a book, I would have read all of the stories for you, but this is an oversized magazine where each four column page measures approximately 10-3/4″ X 14″ so we’re talking about a lot of words here! Besides that, it’d be pretty boring if I were to report back to you summaries of these often antiquated stories and frustrating for me in the cases where the stories are serial entries that we leave me hanging looking for more. So I’ve approached the non-fiction articles in this issue as I have the reportage in the other issues we’ve taken on in Random Issues. For the fiction, I thought it’d be more interesting to just give you a little tidbit of information about each author, as this is a star-studded issue for collectors of fiction. I hope that sits well with you. 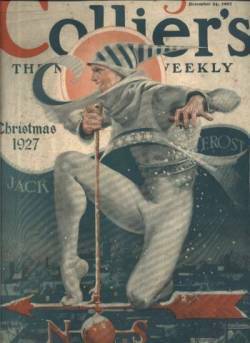 Okay, let’s leave E.M. Jackson’s somewhat intimidating illustration of Jack Frost behind and get inside this issue! Round 4 of “Bigger and Better” by H.C. Witwer. “Christmas Belles”. Harry Charles Witwer, 1880-1929, was a popular writer throughout the 1910’s and 20’s. His books appear to all be out-of-print at this late date. Witwer appears to have specialized in sports stories with “The Leather Pushers” about boxing and another World War I themed story titled “From Baseball to Boches.” He also wrote “Cain and Mabel” which was later turned into a Clark Gable-Marion Davies film. Main character Larry Cain was heavyweight champion of the world in this story. Illustrated by R. Van Buren. “The Stolen City” by William G. Shepherd is about the citizens of Cincinnati finally getting fed up with corruption and democratically overthrowing the local government. To illustrate the corruption the first half of the article centers on local drug dealers, mostly in morphine and cocaine, and how they easily plied their trade by paying off law enforcement. This section even goes so far as to show the profit made from dope peddling in those days: 1 ounce of morphine cost a dealer $30.00, 350 empty capsules was but 70 cents, and agents would receive 25 cents per capsule totaling an outlay of $118.20 for the dealer. The 350 morphine capsules would sell for $350.00 providing a profit of $231.80 per ounce for the dealer. One of the drug dealers detailed in the article claims to have made $455,956 (how precise!) over a two and a half year period. The citizens of Cincinnati had nowhere to turn as corruption spread throughout the city government in both parties. The city government proceeded to raise taxes one time too many and finally the citizens struck back. After voters rejected the proposed hike they went one step further and voted to change the city charter and create a city council of nine members. The council, composed of men of no party, in turn selected a mayor and a city manager. Cincinnati made this switch in local government in 1924. The article concludes by noting that crime is falling and streets are finally being paved with the money saved by the city council. “The Barking Dogs” by Sax Rohmer. Rohmer, 1883-1959, born Arthur Henry Sarsfield Ward, is a highly collected fiction writer who’s most famous creation is the classic character of Fu Manchu. Rohmer published under variations of his real name from as early as 1903 but stuck with his pseudonym after using it on 1913 break-out story “The Mystery of Dr. Fu Manchu.” “The Barking Dogs” is part of the serialization of “The Emperor of America” which was published in book form in 1929. The Page of Fu Manchu is an incredible Rohmer/Fu Manchu site with which any fan or collector should be acquainted. Illustrated by R.L. Lambdin. Pretty good stuff. Other sports stars and personalities whom Rice intones New Year’s wishes for are Tex Rickard, Bobby Jones, Jack Dempsey, Gene Tunney (“Please send me Jack Dempsey…”), Ty Cobb (“…another pair of legs…I’d like to pick up 4,000 more base hits…”), The Golf Duffer, Bill Tilden, Helen Wills, C.C. Pyle (“Please drop another Red Grange in my stocking…”), Connie Mack, Yale, Knute Rockne, Ruth Elder, Football Fan, and John McGraw. There aren’t any photos of any of these stars, basically the Who’s Who of the 1927 sporting world, but there are several small drawings representing them such as a generic left-handed batter at the plate who is surely Ruth, a little C.C. Pyle gripping a Red Grange doll, similarly a Knute Rockne character holding a toy horse with four riders. It’s a fun single page from one of the best writers in the history of sport. There isn’t too much biographical information available about John B. Kennedy, author of short story, “A Way With Women” about a character named Seumas Flaherty. The FictionMags Index seems to indicate his activity over about a decade from the mid-1920’s through the mid to late 1930’s mostly at work for Collier’s and splitting his time between fiction pieces and articles. Illustrated by John Alan Maxwell, 1904-1984. They go on to give the address where to send your Nameographs. Besides these few that are grouped together a single Nameograph will appear here and there throughout the magazine. From top to bottom, left to right, the Nameographs shown here are: Gertrude Ederle, Doheny, Wick, John Bull, Tilden, Chamberlin, and Indian. 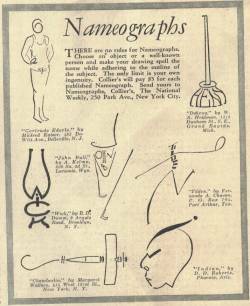 I really enjoyed these as I hadn’t been exposed to them before, and while I can see if you have a steady hand and any sense of how to draw it would be pretty easy to create a Nameograph out of anything or anybody, I still found some of them very creative. Out of these I especially admired the Gertrude Ederle and Big Bill Tilden works. A serialized entry of “The Water Hole” by classic western author Zane Grey, 1872-1939. One of the most famous western authors of all-time, Grey stories of the west can be found in scores of magazines, books, and films. There was even a western magazine named after him, Zane Grey’s Western Magazine. Illustrated by Harold Brett, 1880-1955. “The type of joke that is sought after by comedians is the ‘belly laugh’ or ‘wow.’ This is the gag that lays ’em in the aisles.” So says Eddie Cantor who chimes in with “Now You Tell One” an article about jokes: where they come from and how to tell them, with tips for aspiring comics. There’s a photo of his pal Will Rogers, who Cantor credits as the greatest ad-libber of them all. One time when he met President Coolidge, Rogers leaned over and whispered, “Beg pardon, but I didn’t quite catch the name.” Cantor talks about timing, says the best humor is usually self-depreciating, and says Americans are pretty much the same as far as their senses of humor with there being no actual “humor belt” in the country. 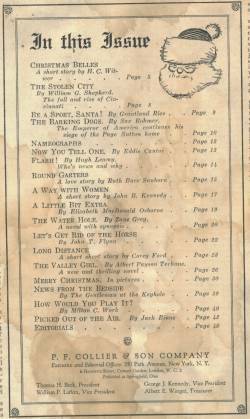 A feature of Collier’s was the short short story, in the case of this issue a one page story titled “Long Distance” by Corey Ford, 1902-1969. Ford had several stories turned to film mostly through the 1930’s up until 1946’s “Cloak and Dagger” starring Gary Cooper. But Ford seems to be best remembered for Eustace Tilly, a character in an early New Yorker story titled “The Making of a Magazine and the name given to Rea Irvin’s famed dandy character who appeared on The New Yorker’s first cover and annually thereafter. Illustrated by Jeff Tester. I’ve included images of both pages of the “In Pictures” feature for this issue. 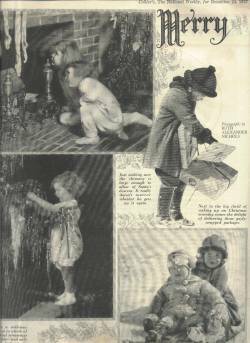 Aptly titled “Merry Christmas,” the photographs by Ruth Alexander Nichols show what are now all very old-fashioned images, probably my favorite of which is that of the two young children peering up the chimney with stockings dangling in front of it. 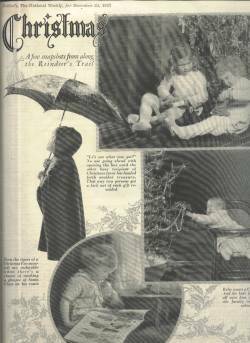 This photo feature was a regular Collier’s feature at this time and often included images of movie stars or other celebrities of the period. “The Valley Girl” is a serial entry from Albert Payson Terhune, 1872-1942, which makes me stop to say, wow, what an issue for fiction! If you like collies, then you need to read Terhune. His stories are mostly about dogs, mostly his favorite breed, collies, and his home in New Jersey, Sunnybank, which has at least a couple of entire web sites dedicated to it! Terhune’s best known stories were about his own collie, Lad, which are credited with popularizing the collie breed. Oh, the power of the pen! This story is about a fellow named Gavin Cole, who is attacked by a convict and has his life saved by a collie called Heather. Illustrated by Harold Von Schmidt, 1893-1982. Ruth Burr Sanborn, 1894-1942, published stories from the early 20’s through the early 40’s, often in The Saturday Evening Post. An Amazon.com search for any books by Ms. Sanborn brings back two out-of-print results. Clicking on the titles reveal that they are listed as just 4 and 5 pages long. Still, I’ve come across her stories in several magazines of her period. “Round Garters” features illustrations by Henry Davis.